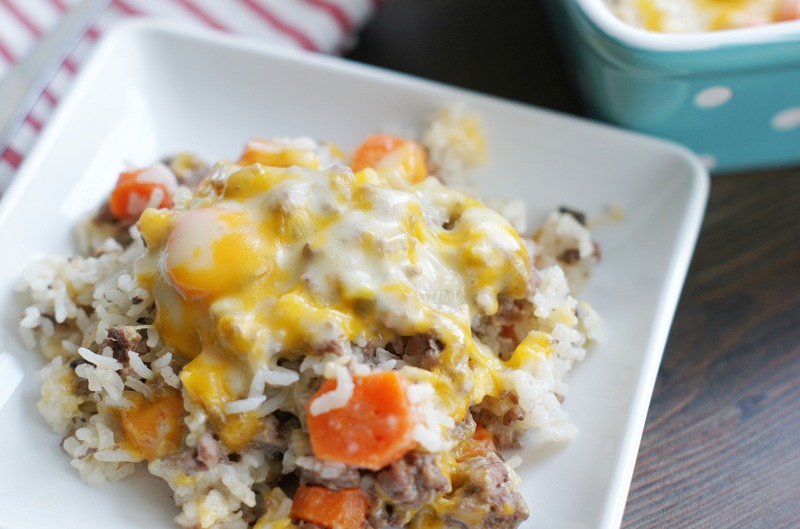 This Cheesy Ground Beef and Rice Casserole is simple and so delicious! Total comfort food and so easy to throw together. Even your pickiest eaters will love this. 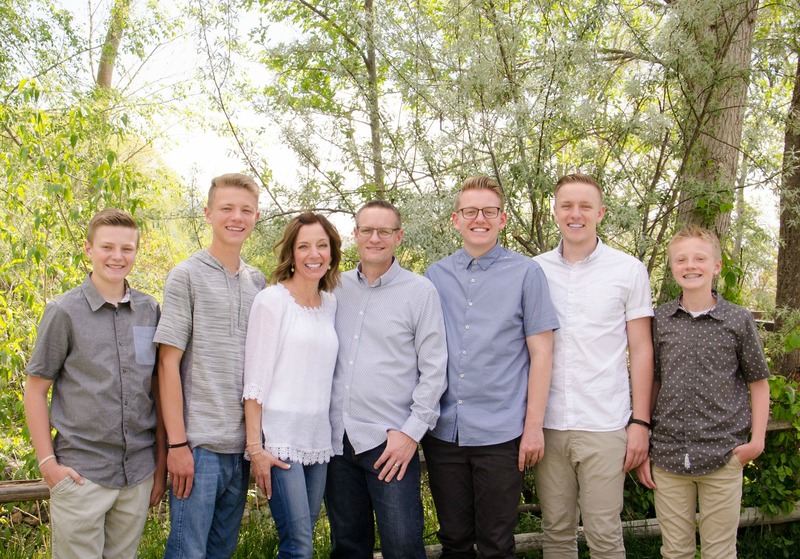 It’s February (just in case you’ve forgotten) and I live in Utah and yesterday I opened my kitchen window and sliding door to let some fresh air in. . .how insane is that folks? My car said it was 64 degrees. There is no snow on the ground and none in the forecast for the next 10 days. Have we even had winter? I don’t think so. It’s totally crazy. I’m not going to lie though, I am enjoying it! I hate the cold so these warmer temps have been making me so happy. I know we need the snow and I’m sure it will come in April and May. Mother Nature just has things backwards right now for Utah. 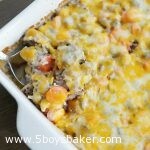 I love making yummy hot soup on cold snowy days, buuut since we haven’t had any of those I made Cheesy Ground Beef and Rice Casserole. In fact, I made it twice this week because it was so good (and because I didn’t get any pictures the first night :)). This is just simple, delicious, uncomplicated food. I love it. No weird ingredients, just everything you probably already have in your house. In 10 minutes it’s ready to throw in the oven and then 90 minutes later out comes a fabulous dish. Let me know what you think! Preheat the oven to 350 degrees and grease an 8x9" baking dish. Cook ground beef and salt, drain excess grease off. Set aside. In a large bowl, whisk together the water, milk and cream of mushroom soup. Add, cooked beef, rice and carrots and stir to combine. Sprinkle top with a little seasoning salt. Pour into an 8x9" baking dish and bake, uncovered for 90 minutes. Sprinkle with cheese or add slices of cheese and return to the oven for another couple of minutes or until the cheese is melted. Just plan ahead because this does need to bake for 90 minutes. It's fast to throw together, it just takes a while to cook. Do I need cream of mushroom soup for this recipe? Yes, 1 can like the recipe says. I made this for dinner tonight and it was really delicious. It is so simple like you said, but came out really good. The only change I made was I used a homemade cream of chicken soup from Mel’s Kitchen Cafe instead of the canned soup. Thanks for a great dinner. Loved how I could get things done while it baked away for 90 minutes. Thanks Teresa for the comment. I’m so happy you made it and loved it. I need to try that homemade cream of chicken soup. I keep telling myself I’m going to and then I just take the easy way out and open up a can of Campbells, but now you’ve inspired me! Take care. That sounds delicious Kristy. Thanks for sharing! Do i add season salt in it? Hi James! Just sprinkle the top with a little bit of season salt. I just used the regular size (10.5 oz). Glad you liked it! Thanks for letting me know. Is the cooking time because if the carrots? I ask because I’m leaving those out in favor if whole kernel corn. Hi Tracy. The long cooking time is more for the rice. You could certainly cover it with foil which will keep the steam in and probably speed up the cooking time, I would still give it at least 45 minutes covered. Let me know if you try it. Thanks for the heads up Jodi! I used Minute Rice (precooked obviously), so time in the oven was really a matter of letting everything smother together well. A few tweaks: I added onion and garlic to the meat; skipped water and used Cream of Mushroom with Garlic soup, milk and added sour cream for creaminess; tossed in a few dashes of Worcestershire sauce and splash of Marsala to zing it up; went with whole kernel corn instead of carrots (personal preference) along with sauteed mushrooms; added some of the cheese to the mixture; tossed Panko on top and about 15 minutes later added a touch more cheese until melted. Alot of tweaks I know, but your original recipe served as a wonderful pallet for me to show a bit of creativity. 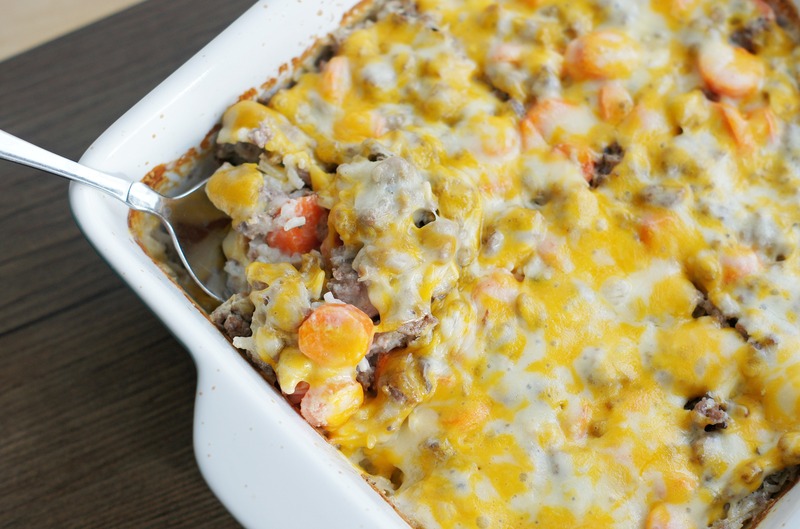 Definitely making this again…HUGE hit around my dinner table! Wow, that sounds delicious. Yes, definitely a lot of tweaks, but I love it! Thank you for sharing. If you have any fabulous recipes I should try, I’d love for you to send them my way. I think frozen vegetables might get mushy. I wouldn’t shorten the cooking time because the rice needs to cook that long. You can certainly give frozen vegetables a try, but I’m making any guarantees. Hey quick question, I’m allergic to mushroom would cream of chicken work the same? It should work just fine, it will just change the flavor a bit but will still be delicious. I use cream of chicken soup in my slow cooker pot roast recipe and it’s so good! For this particular recipe, how many does it serve? Hi Natasha! This recipe yields about 6 to 8 servings. Thanks for looking. Hi Sherrill, unfortunately I don’t provide the nutritional count for recipes, but there are plenty of websites where you can input the recipe and it will do it for you.